We hear so many people telling us they need to give up their cat because someone is allergic to them so this is a very heart-warming story we wanted to share. Puss Cat turned up as a stray in a garden in Eye, a village in Peterborough. 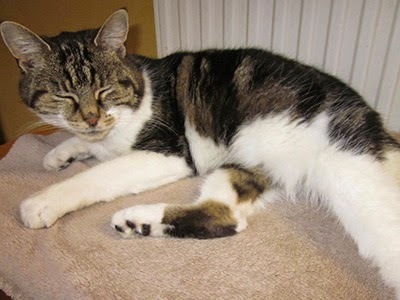 She was in very poor condition – she had a severe flea allergy which had caused many open sores. Karen, whose garden Puss Cat was found, was concerned but also very allergic to cats and so contacted us. Puss Cat was scanned for a microchip and we looked through our lost cat records and databases but no owner came forward. Unfortunately we had no space at the time to take her in so she was given a place to sleep in Karen’s garden shed while having treatment from the vets for her sores. Gradually as she healed Karen became very fond of Puss Cat – though at first just spent time with her in the garden. After a while Puss Cat was given a bed in the corner of the kitchen by the back door. It was separated from the rest of the kitchen by a perspex sheet so that Karen’s allergies did not flare up but so that Puss Cat could feel part of the family. Karen kept a special fleece which she wore only to give Puss Cat some fuss to prevent her fur spreading through the house. At Christmas Karen and her family officially adopted Puss Cat and this lovely story shows that with time and patience even people with allergies can enjoy the love and affection of a cat and the joys that pet ownership brings. Veterinary note: There are now products on the market, which, if used regularly, can allow people who are allergic to felines to keep a cat. In tests, Petal Cleanse alleviated the symptoms of 90 per cent of allergy sufferers. For more information on Petal Cleanse and many other products endorsed by Allergy UK, visit their website www.allergyuk.org or phone them on 01322 619 898. There are additional tips for managing allergies in our Cats and people leaflet. If you don’t own a cat but are thinking of getting one, a visit to someone who has a cat or to a Cats Protection adoption centre may indicate whether you are allergic or not – although some people may react to some cats and not others. If you are suspicious that you are allergic, it may be a good idea to speak with your doctor first. When I first got a cat, some 39 years ago, the first three days were horrendous! Runny nose, streaming eyes, and wheezing chest. I desperately didn't want to have to rehome my Tiger (he was a tiny tabby at the time), but after the first few days the symptoms started to subside and I have kept cats ever since at one time having seven, due to a rescue cat being pregnant when she arrived! Really glad to hear that your allergies disappeared and you were able to keep your cat Tiger! I agree, I was always sneezing and wheezing as a child when I petted cats. However when Rosie appeared in my life my symptoms flared for first few weeks and now it's fine...I really think you build immunity. I pet her, love her and she goes everywhere and no sneezing! That's great Matt, so glad to hear you no longer suffer with allergies! I did have a dog called Darcy but lost ob 24 august 2013 now I want change Try have 2 years old female cat my promble is mum allergies to cat so be look after cat most. my mum was allergic to the fur of cats and dogs I remember when she used to come to mine wore rubber gloves so she could stroke the animals, this didn't stop her from having her own pet or giving love to others, there always a way to enjoy a pet, sadly my mum passed some years ago but I remember I have a cat but sadly my other pets have passed away to .